In the past, we had to spend hours on end to be able to listen to the songs that we downloaded from the Internet. However, nowadays not only is it possible to download any track at great speed, it is also possible to play any multimedia track available over the web almost instantly. This is exactly what can be done with Clickster, a simple application from which you can download or, simply, listen to the songs of your favorite artists. - Find songs or artists by means of the integrated search box. - Create your own playlists with your favorite tracks. - Download songs from web servers, in a quicker and more private way than over a P2P network. 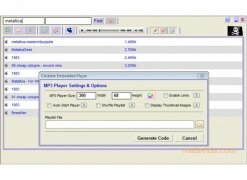 Furthermore, this program integrates a player the features of which you can modify from the configuration options: change the size of the interface, activate random playback, select the color range,etc. Although it's true that Clickster doesn't offer access to a vast amount of music files, its high download rate and simplicity of use make it a good alternative to P2P applications like LimeWire.